2016 has been a busy year both in and out of app stores — new devices, improvements to the buying experience, support for the subscriptions model, and a new App Store for iMessage apps kept developers busy. 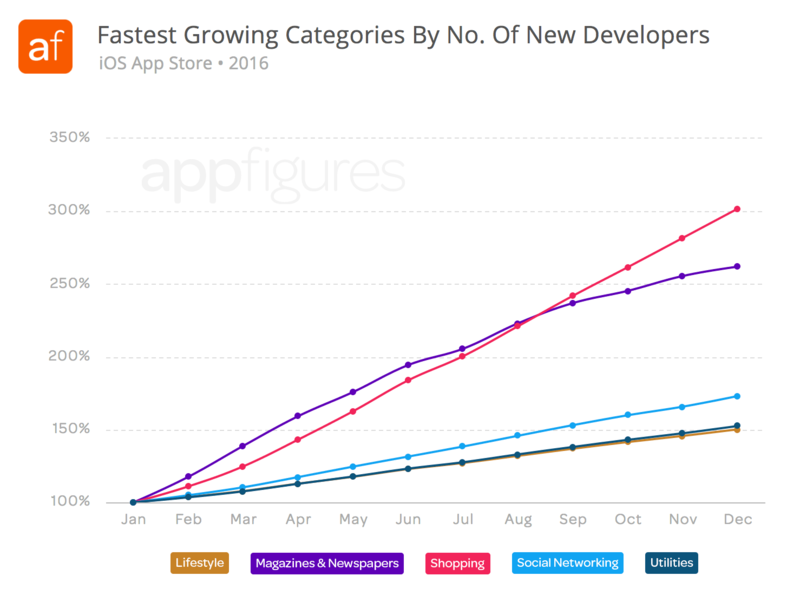 In fact, app developers have shipped the most new apps in a single year so far, including two of the biggest releases: Pokémon Go and Super Mario Run. Keep reading to find out which categories grew the most, how most games monetize, and more. Over the years, we’ve seen the number of app releases grow substantially year-over-year as smart phones became standard across the world. In 2016, new and existing developers published a total of 1.1 million new iOS and 1.3 million new Android apps. 2.4 million apps in total isn’t only an incredible number of apps, but also the most apps ever added in a single year. However, as incredible as this total is, it’s only marginally higher than 2015. Comparing year-over-year growth, it’s obvious things are starting to slow down. Taking into account the number of new releases for the last few years, you can see that the totals are starting to be constant. Over a million apps were added to the App Store for each of the past two years and to Google Play for the past three years. One tricky aspect of growth is that the bigger you get the harder it is to sustain double digit growth rates. This year both stores opened with a pretty big catalog of apps. Just as an example, for the App Store to have the same growth as last year developer would need to produce more than 1.5 million apps–roughly 500 thousand more than they actually released. Don’t take this the wrong way, even at a moderate growth rate, app stores will continue to thrive. We see this slowdown in growth as a sign of maturity and stability. What maturity means is that these stores have become entrenched into the lives of billions of people around the globe. Which is great news if you’re in the business of making apps. Note: We’ve included The Amazon Appstore in some areas of our report, however, with less than 30,000 new apps released in 2016 the Amazon Appstore is no competitor to Apple or Google and will not be the focus of this report. More than 300 new iOS and Android apps were released every hour in 2016, making Apple’s app reviewers pretty busy. Let’s take a closer look at what kind of apps these were. On the App Store, the Shopping and Magazines & Newspapers categories have seen the most growth, followed by Social Networking, Games, and Food & Drink. 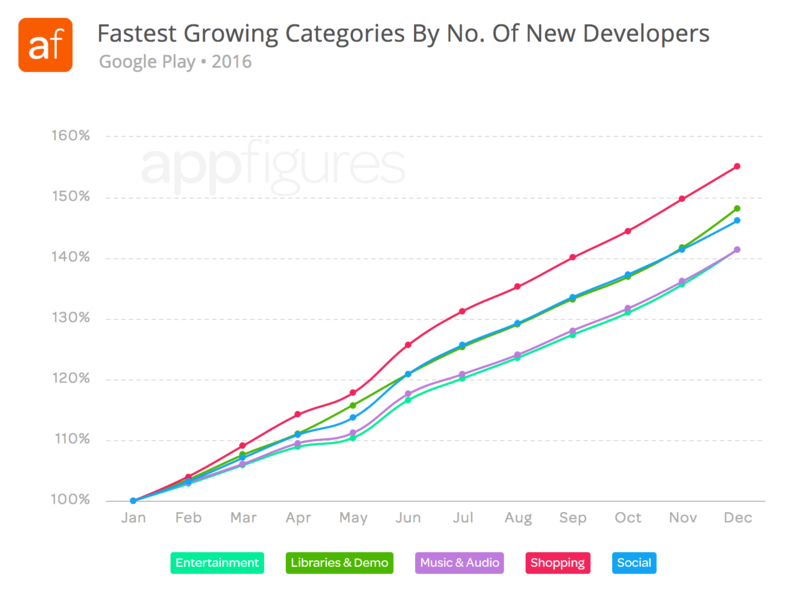 Although Games was not the fastest growing in 2016, it did have pretty impressive numbers on the App Store. The category nearly doubled in 2016, adding more than 200k new titles to close the year with almost a half of a million games. Bravo Game developers! 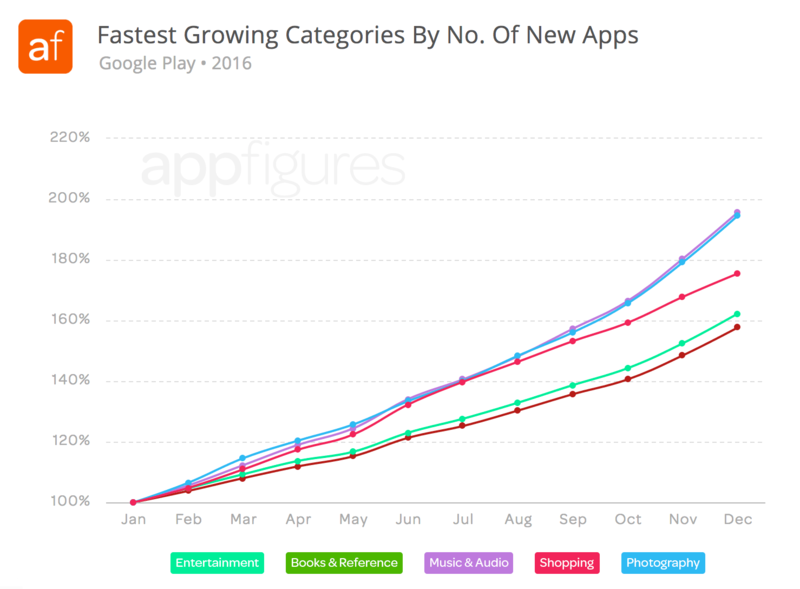 On Google Play, Music & Audio and Photography have dominated, each almost doubling. Shopping, Entertainment, And Books & Reference follow, all growing more than 50% each. Increased popularity of mobile commerce (aka. mCommerce) in 2016 resulted in a barrage of new apps, growing the shopping category three fold on the App Store and by nearly doubling it on Google Play. However, not all shopping apps were created equal. In late 2016 many “fake” shopping apps were detected across both app stores. The fake apps were made to look like the real brands’ app so customers would give them private information. Luckily, both stores caught this in time and removed them right away. because they’re no longer active, these apps aren’t included in our analysis. In September, Apple announced new regulations that threatened hundreds of thousands of abandoned apps. This raised an obvious question: Is the App Store so big that Apple is okay thinning its catalog? Probably. While reducing unnecessary competition, this could also be a strategic move by Apple to use quality to differentiate itself from its rival, Google, whose guidelines are much more lax by comparison. The new regulations effectively force developers to constantly update their apps or face removal. As a policy, this has ramifications for developers but also for the growth of the store. Forcing developers to focus on updates rather than new releases could continue the plateau we’re already seeing. We’ll be keeping an eye on this in 2017. Just as with number of new apps released, we analyzed new developers who entered the market by looking at the first app released by each developer. This includes apps that are no longer available on the store. 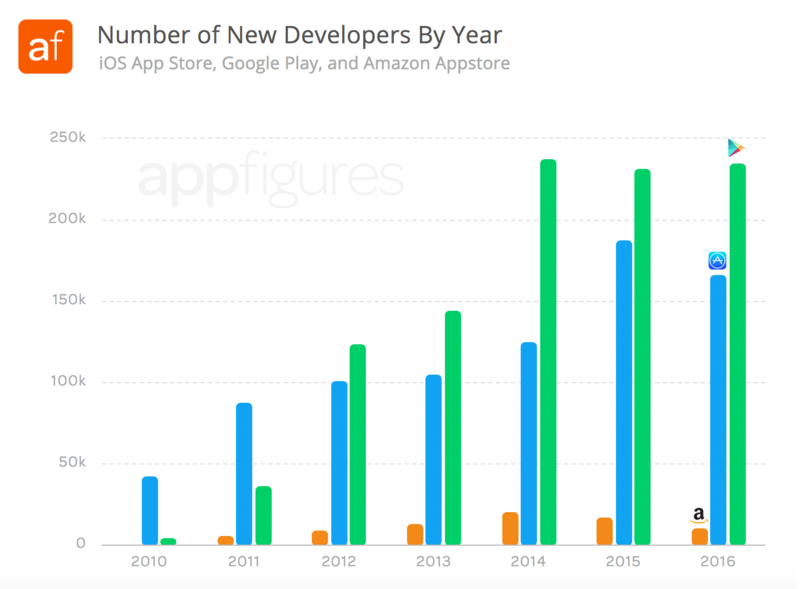 Not surprising, the number of new developers releasing apps has begun to moderate in the exact same manner as the number of newly released apps. 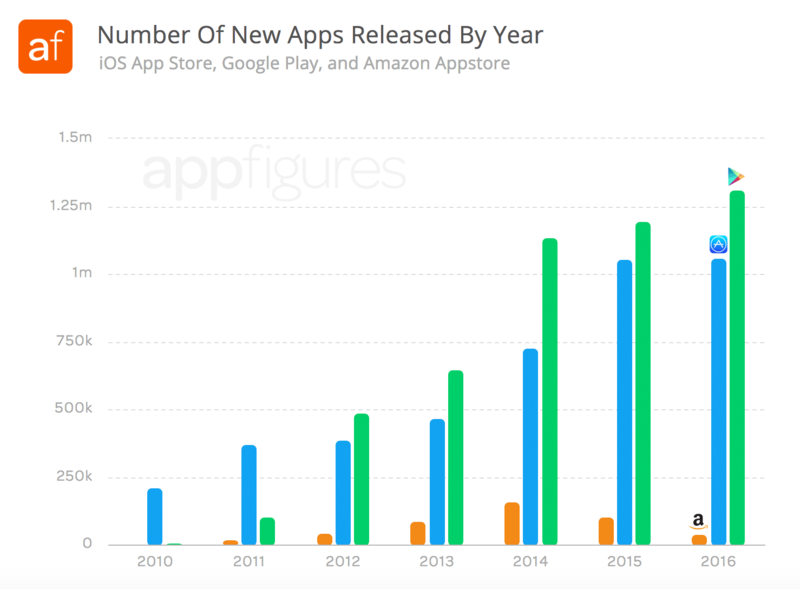 In 2016, more than 412 thousand new developers released their first app. Roughly 60% of those new developers released apps for Google Play with the rest releasing their apps on the App Store. As of the end of 2016, Google continues to maintain its lead in this category as well. Although growth has slowed down, numbers in the hundreds of thousands are still high enough to suggest there is enough excitement about the opportunities that making apps affords. Putting aside that new developers and apps has slowed, we pulled the top five fastest growing categories with the most number of new developers to see if there were any similarities to the categories found for new apps released this year. There is. As you can see, these line up pretty well with the fastest growing categories from our apps section. The Shopping category dominates with double digit growth on both platforms, followed by Social, Entertainment, and Utilities. Many developers turn to 3rd party tools to help their apps run more smoothly. We looked through millions of apps and compared 20 different categories of SDKs – from Ads and Analytics to Payments and Notifications, to find the top categories and top SDK providers. Ads lead the way by a wide margin, which makes sense considering that’s a way of monetizing apps. Analytics and dev tools compete for second place, followed by Authentication and Backend as a Service SDKs. Nearly 65% of all apps in our analysis had at least one ad network installed. AdMob commands the category. Being integrated into the Android development experience gives it a clear advantage. Chartboost and Facebook follow behind, albeit with a big gap. Knowing how users interact with an app is essential to developers. 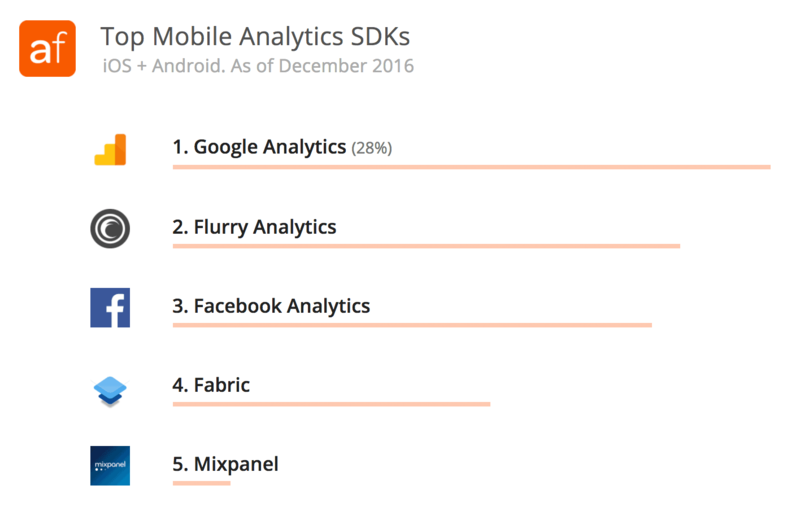 That’s why we were a bit surprised that only 30% of all apps had an analytics SDK installed. Again, Google leads the way, followed by incumbent Flurry and Facebook right behind. Many apps and games are built using development engines that streamline the process and enable cross-platform publishing. 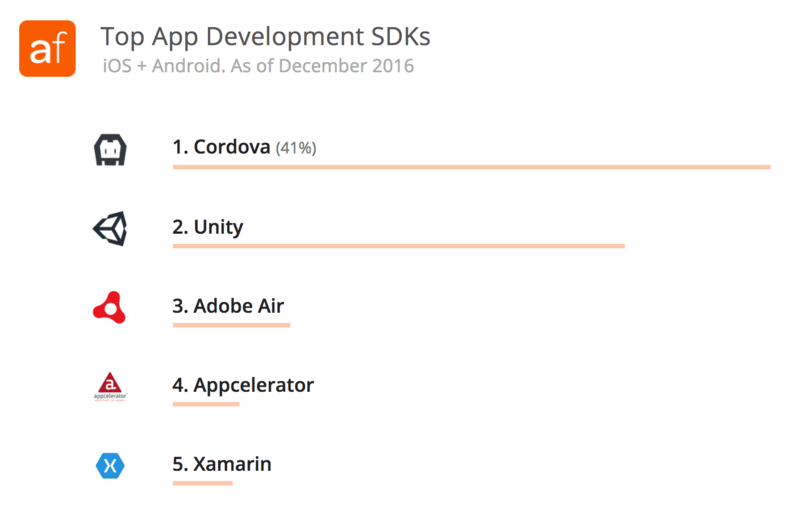 In this category, Cordova leads the way, followed by Unity with Adobe Air a distant third. Leveraging a user’s existing online presence makes for much smoother on-boarding and retention. And what better platform is there for online presence than Facebook? The data says there isn’t. Firebase and Parse are the most used BaaS SDKs. While there are a few competitors, they’re very small at this point (under 1% market share total). 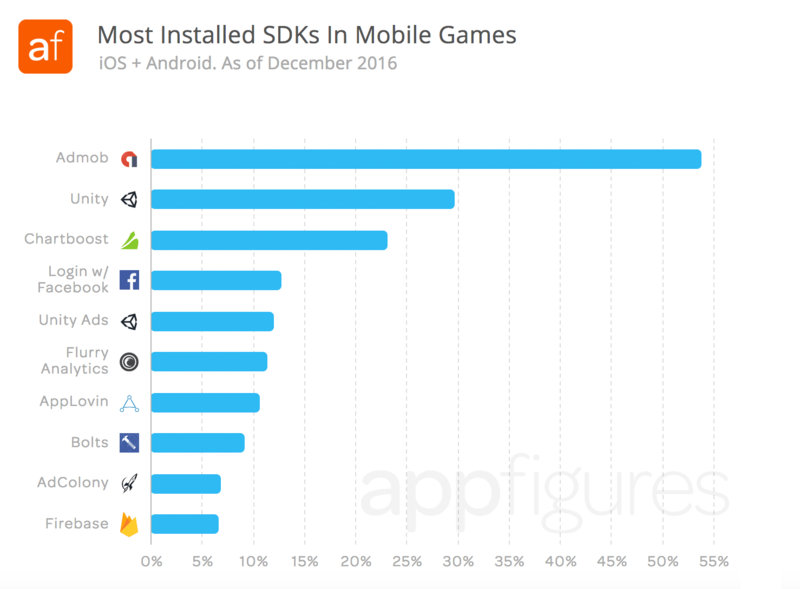 Games account for more than 25% of all apps and more than half of those apps use at least one SDK. 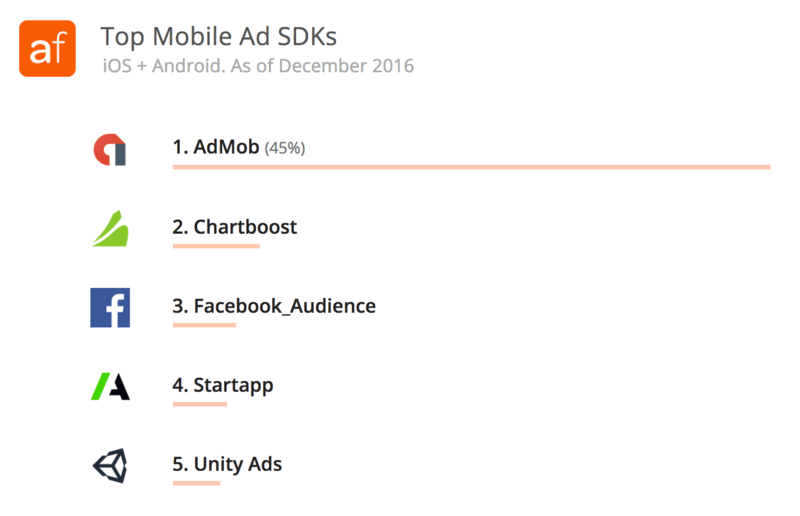 5 of the Top 10 most used SDKs are ad networks. Considering a majority of games are free, this makes a lot of sense. A selection of tools, like Unity and Firebase, show that game developers don’t like to reinvent the wheel. 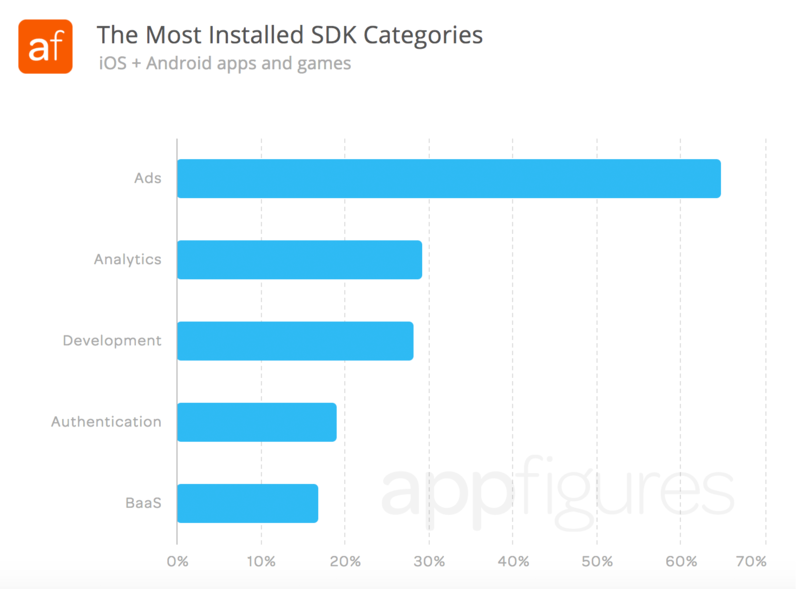 If you’re keeping count you’ve noticed that SDKs from Facebook and Google lead in almost every category. Advertising to backend services, SDKs from these giants are installed in more than 70% of all apps. So, roughly 2 of 3 apps on your smart device talk to Google or Facebook. The theme of maturity is consistent across both stores, leaving us with some compelling questions for the new year. How will Apple’s cleanup affect its growth in 2017? Will Google follow suit? Will consumers find the subscriptions model appealing? Only time will tell. One thing’s for sure, the app economy is thriving and stable. Data for this report was gathered using Explorer, our mobile app search and intelligence platform. Explorer covers 9+ million apps from all major app stores and provides app store info, SDK analysis, app ranks, ratings, and more. Written with the help of Lucas Dowiak and Josh Vernazza. Awesome report, thanks a lot! However, my colleague found another report that claims the number of APP developers is about 12M.